The Saab 9-5 is a very popular car to buy used because of the luxury vs price ratio. However, whenever cars end up in the “dirt cheap” realm, people decide to forgo maintenance and you end up with a beater. It doesn’t have to be that way! We sell tons of parts for the 9-5 to help make it feel as upscale as it deserves (after all, it did cost upwards of $50K when it was new! ), and one of the biggest single areas that can transform the way one drives and feels on the road has to do with the subframe bushings. Meant as a buffer between the road and the body, the little rubber mounting bushings take a lot of abuse. For one, all of the lower suspensions bolt to it. The engine also mounts to it, as well as the complete drivetrain, brakes, steering, cooling…. Bottom line, when these little guys go bad, so does the quality of your ride. Powerflex Subframe Bushings are guaranteed for life, meaning you’ll never ever have to do this job again! 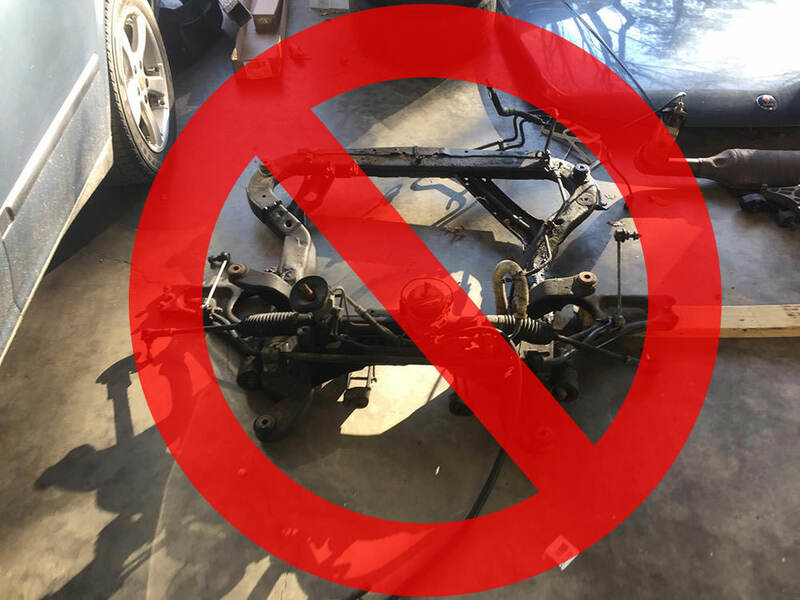 You don’t have to go through the trouble of removing the entire subframe! Flat or broken subframe bushings can transmit a ton of road vibration into the chassis of the car. It can also destroy the effectiveness of the suspension geometry to do its job, as well as the engine mounts. If your Saab bangs and crashes over harsh and uneven roads, or feels a little wallowey from the front end, put the car up on jack stands and grab a crowbar. If you can put it up between the subframe of the car and the body and easily shift the entire subframe around, you’re looking at doing your subframe bushings. Historically, this meant dropping the subframe out of the car, which was a huge job (for the reason mentioned before, nearly everything on the front of the car is bolted on it) and required a press. However, through some experience being around experts, another method presented itself that we thought we would give a try. To do it, you need a hole saw style drill bit, a sawzall, and a spare floor jack. You will also need a set of Polyurethane Subframe Bushings, which we offer in both Powerflex and Proparts. Don’t fret, in our experience putting polyurethane bushings in this position do not degrade the ride quality, only improvements are allowed here! Keep in mind both Powerflex Street (purple) and Powerflex Race (black) carry a lifetime warranty, meaning you’ll never have to do this job again! Read more about Powerflex Polyurethane bushings [here]. Step 1: Raise the car high on the tallest jack stands you have, or use a lift. Make sure everything is very secure, be safe. Step 2: Remove the rear support bracket from the exhaust tunnel, as well as the belt guard. Step 3: Take the mounting bolts completely out of the four rear bushings. We don’t need to do the fronts as there is little to no play in these. This is typical. You can still change the fronts if you want to. Step 4: Loosen the two front subframe bolts but don’t take them completely out. Step 6: Finish them off by cutting the outer races that are left in the subframe with a reciprocating saw (Sawzall). Be careful not to nick the housing. Step 7: Put a new greased up Poly bushing above one of the holes (whether it be ProParts or Powerflex, doesn’t matter) with the thicker lip facing up. Make sure it doesnt have the center metal part in, the bushing needs to use that room to flex. Use the weight of the car as your press, and apply pressure to the subframe directly under the bushing with a floor jack. When all goes to plan, the bushing will pop in with an extremely satisfying *PLONK*. Repeat on the other three. Step 8: Install the central metal part of the bushing on all four, and slide the metal flat washer on top of the bushing between the subframe and the body of the car. This will give the bushing something smooth to interface with, and to keep it from tearing under stress. Step 9: Install all of the bolts and use new hardware when possible. The workshop manual states 75ft/lbs plus 45 degrees (yes they are stretch bolts). Step 10: After everything is tight, go for a ride and enjoy a new found solid ride, your 9-5 will be one step closer to feeling like a new car! Head over to our catalog and pick up your set of Subframe bushings today, just imagine how much better you’ll feel without this job always looming on your to-do list! Very helpful ! Thanks for the great info! time to finally fix that clunking on the left front. Great tutorial! Will poly bushings solve vibration while stopped in Drive? If so, I think I’ll finally tackle it. Thanks. Hi Steve, have you done engine mounts yet? Is your car an automatic? Yes – all but the rear and yes, it’s an auto. Having done the Saab bushings on my 03 9-5 and dreading doing them on my 01 Aero wagon this came in handy. The subframe bushings are indeed a huge job. I might just try this instead of the subframe drop. I’ve been told that the poly bushings “squeak”, is this true? I’ve had these in for about a year and a half and haven’t noticed anything. These are in a position where they don’t rotate. I would suspect you may encounter this in a position like a control arm bushing that rotates on an axis, but only if you don’t properly grease them. Poly bushings in high flex areas like these should be pulled out and regreased biannually if you live in high dust, high heat, or high salt areas. 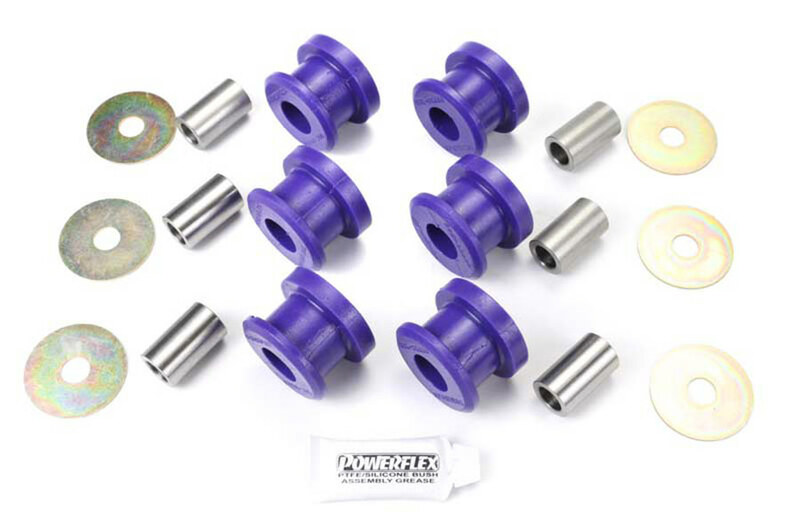 Ungreased poly bushings can also tear, although Powerflex brand has a proprietary formula that carries a lifetime warranty, which is why they are more expensive. Now that it’s about the 2 year mark, how are the ProParts subframe bushings holding up? Have you had to remove and re-grease at all? I actually had them in for about a year prior to making this, so these have been installed for nearly 3 years!! So far, no complaints at all, but I will make a point to try and get some grease in there the next time the car is in the air. The front end is very composed with the new KONI suspension I installed, as well as control arm bushings, engine mounts, and tie rods. Very firm and direct but still comfortable. Hi Adam. Could you put new stock rubber bushings in using the same method? Hy Ryan, unfortunately you cannot. You can remove them the same, but you will need to remove the subframe completely from the car and use a hydraulic press in order to push the bushing into housing. Great article for when I do my 9-5. My question is if the procedure is similar for my 9-3 (specifically a ’08 9-3 Aero with the 2.8)? First I need to mention this is NOT the procedure on how to do these. To do them correctly you must remove the subframe and use a press. This is to cheat the procedure, and would technically be applicable to any similar designed bushing with a rubber center and an outer race from BMW to Buick. It is up to you to evaluate your current problem, and decide if you can get away with such a drastic shortcut. I asked the other day but will poly bushings eliminate the dreaded vibration while stopped in Drive? I’ve replaced all engine mounts other than the rear which looks OK. I jacked up the rear to see if there was any movement in the rear mount and there is none. It most likely will not, I’ve never seen anyone successfully kill this vibration. I think it might have something to do with something out of balance in the torque converter setup, but I really don’t know. Maybe someone more knowledgeable will come across this and have a better answer. Are the Propart poly bushings installed the same way as the video of the Powerflex bushings? So the guide says to “use new hardware when possible”, but is that absolutely crucial? I can’t even find them here on eeuroparts. In case anyone else is going to be trying this, here are a few notes from my experience using purple Powerflex bushings. I have a 2005 9-5 Aero, manual. I was working in my garage, with jack stands, and didn’t have enough room for a Sawzall. I ended up using a jigsaw upside down. It didn’t work too badly to get the races out. Even with that I had to use a pry bar to get them out (the back ones). Also, following the steps above didn’t give me enough room to get to bushings in. I had to take the nut off the rear engine mount, as well as take out the two bolts that attach the steering rack to the subframe. Once I did that I had enough room, when prying, to get the bushings in. Finally, the video says to put the washer between the bushing and the car, but in the video he puts the washer on the bottom. The Powerflex instructions say to put it between the bushing and car, so just be aware of that difference in the video. Unfortunately I still have a clunk over bumps, but the car does feel much, much better. Hi Nate, getting the subframe to drop enough to get the bushings in can be tough, but manageable. When we did it, we didn’t need to loosen those things but I believe doing so is probably a better idea anyway. With the washers, during the video filming a mistake was made due to the Proparts bushings not coming with any instructions, which is why the video instructions explain specifically where those washers do go. For the sawzall, yes you need a very high jack stand set to clear it, or a smaller style sawzall. We have seen people do this on jackstands with just barely enough clearance. The clunk you are hearing over bumps is very likely to be a sway bar end link, as these are very typical to fail and they do make a very clear loud clunk even over small bumps. They often appear to be completely fine on inspection, but when you take them off you will notice a small bit of play in the ball end. Even if it didn’t fix your clunk, as you said it will feel much better, and your alignment won’t deflect anymore due to the worn out subframe bushings which is a huge plus. Tackled this morning, all in about 3 hours of work on jack stands. I bought a small Milwaukee hackzall so I didn’t have issues with clearance under the car. Thank you for putting this out there. Very easy process for an good backyard wrench. My 2008 9-5 Combi has 120k miles and the rear bushing were TOAST. The rubber was completely separated from the outer band. The car drives incredible now. The difference is remarkable. Just completed this job with the ProParts (blue) bushings, replacing the rear 2 bushings only (so far). The driver’s side poly bushing initially pushed in (with jack) pretty crooked. It was stretched diagonally along the height of the race, and shortly popped back out. I tried the jack again, and was able to pull the bottom through completely prodding with a screwdriver. My question is if there is any risk that the bushing tore while it was pushed in crookedly? I didn’t see anything abnormal, and didn’t feel anything unusual on the test drive after. Just wondering if this is something I should keep an eye on. I’m going to do this next weekend. I was thinking my clunking left front was these bushing but after reading a post higher up I might need sway bar links. Oh well. More parts I have to order. Trying to save a Gary fisher is tough. The end links are the most likely culprit for sure, but I guarantee that you will find a bad subframe bushing or three under there as well.